Per the National Observer, after AggregateIQ was publicly linked to Cambridge Analytica via multiple news reports, Facebook has chosen to suspend its accounts. Cambridge Analytica received a goldmine’s worth of Facebook user data by partnering with a data-harvesting app. This was technically a violation of Facebook’s terms of service, as it required abusing app permissions, but there’s been growing skepticism over whether Facebook routinely turned a blind eye to such actions as part of its business model. Allegations are swirling Cambridge Analytica may have used that data to power its subsequent work for Donald Trump’s presidential campaign and, possibly, the Brexit referendum. Its former CEO, Alexander Nix, and other employees were caught bragging about unethical or illegal campaign tactics like blackmail in a Channel 4 investigation. 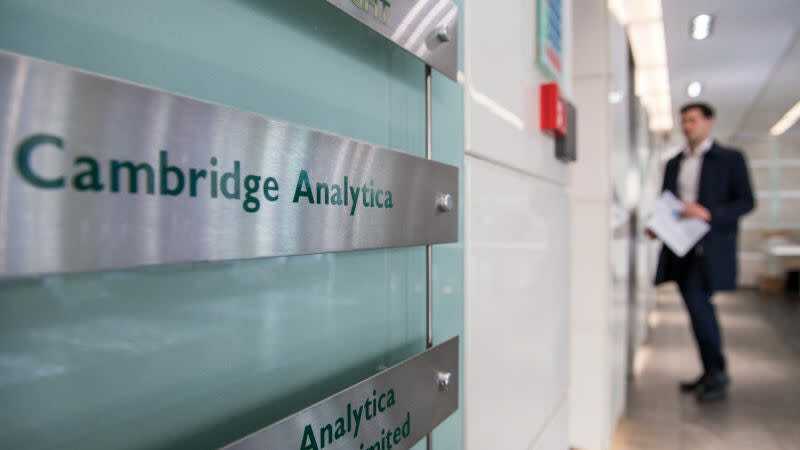 Data scientist Christopher Wylie alleges that while working for Cambridge Analytica’s parent company SCL Group, he helped create AggregateIQ as a Canadian affiliate of the company. The two firms share an intellectual property and service agreement, per the Guardian. AggregateIQ is now under investigation by Canadian authorities for possible violations of privacy law and unauthorized access to data, while British investigators are attempting to determine whether the firm illegally coordinated with pro-Brexit groups to receive payments for campaign work that would have been prohibited under election law. As Gizmodo previously reported, internal files originally unearthed by UpGuard research director Chris Vickery show that AggregateIQ was subcontracted by Cambridge Analytica to build many of its pricey election tools—some of which eventually panned out as vaporware. Facebook’s stock plummeted following allegations that so many users had data extracted from the site without their consent, peaking at a loss of around 22 percent of its value. It’s also had a rough time dealing with another (possibly related) issue, allegations Russian operatives ran extensive misinformation campaigns on the site before the United States’ 2016 elections. Though the company’s stock has begun to rebound, it’s not clear whether its fumbling response to the fiasco has lost enough of its users’ trust and confidence to seriously damage Facebook in the long term. Founder Mark Zuckerberg will testify before two separate congressional hearings this week.